The BD FACSArray is a 4 colours plate-loading syringe-driven sample mixing and injection bioanalyser. This means it is able to analyse cells in suspension in smaller sample volumes in a standard 96-well plate at acquisition rates of up to 15,000 events per second. Our Array has a 488 nm blue laser allowing 2 colours detection (FITC and PE filters) plus Forward and Side Scatter parameters, and a 635 nm red laser that enables 2 colours detection APC and APCCy7 filters). 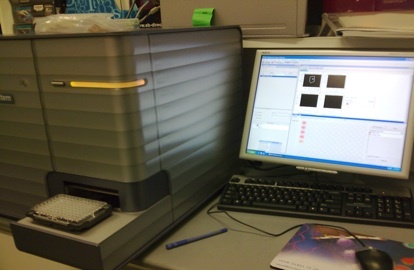 FACSArray is especially convenient for high throughput screening and high- content analysis of cells and analytes (proteins).